In 1610, Galileo Galilei looked up at the night sky through a telescope of his own design. Spotting Jupiter, he noted the presence of several “luminous objects” surrounding it, which he initially took for stars. In time, he would notice that these “stars” were orbiting the planet, and realized that they were in fact Jupiter’s moons – which would come to be named Io, Europa, Ganymede and Callisto. Of these, Ganymede is the largest, and boasts many fascinating characteristics. In addition to being the largest moon in the Solar System, it is also larger than even the planet Mercury. It is the only satellite in the Solar System known to possess a magnetosphere, has a thin oxygen atmosphere, and (much like its fellow-moons, Europa and Callisto) is believed to have an interior ocean. Though Chinese astronomical records claim that astronomer Gan De may have spotted a moon of Jupiter (probably Ganymede) with the naked eye as early as 365 BCE, Galileo Galilei is credited with making the first recorded observation of Ganymede on January 7th, 1610 using his telescope. Together with Io, Europa and Callisto, he named them the “Medicean Stars” at the time – after his patron, the Grand Duke of Tuscany, Cosimo de’ Medici. Simon Marius, a German astronomer and contemporary of Galileo’s who claimed to have independently discovered Ganymede, suggested alternative names at the behest of Johannes Kepler. However, the names of Io, Europa, Ganymede and Callisto – which were all taken from classical mythology – would not come to formally be adopted until the 20th century. Prior to this, the Galilean Moons were named Jupiter I through IV based on their proximity to the planet (with Ganymede designated as Jupiter III). Following the discovery of the moons of Saturn, a naming system based on that of Kepler and Marius was used for Jupiter’s moons. In Greek mythology, Ganymede was the son of King Tros (aka. Ilion), the namesake of the city of Troy (Ilium). With a mean radius of 2634.1 ± 0.3 kilometers (the equivalent of 0.413 Earths), Ganymede is the largest moon in the Solar System and is even larger than the planet Mercury. However, with a mass of 1.4819 x 10²³ kg (the equivalent of 0.025 Earths), it is only half as massive. This is due to Ganymede’s composition, which consists of water ice and silicate rock (see below). Ganymede’s orbit has a minor eccentricity of 0.0013, with an average distance (semi-major axis) of 1,070,400 km – varying from 1,069,200 km at periapsis to at 1,071,600 km apoapsis. Ganymede takes seven days and three hours to completes a single revolution. Like most known moons, Ganymede is tidally locked, with one side always facing toward the planet. Its orbit is inclined to the Jovian equator, with the eccentricity and inclination changing quasi-periodically due to solar and planetary gravitational perturbations on a timescale of centuries. These orbital variations cause the axial tilt to vary between 0 and 0.33°. Ganymede has a 4:1 orbital resonance with Io and a 2:1 resonance with Europa. Essentially, this means that Io orbits Jupiter four times (and Europa twice) for every orbit made by Ganymede. The superior conjunction between Io and Europa occurs when Io is at periapsis and Europa is at apoapsis, and the superior conjunction between Europa and Ganymede occurs when Europa is at periapsis. Such a complicated resonance (a 4:2:1 resonance) is called the Laplace Resonance. With an average density of 1.936 g/cm3, Ganymede is most likely composed of equal parts rocky material and water ice. It is estimated that water ice constitutes 46–50% of the moon’s mass (slightly lower than that of Callisto) with the possibility of some additional volatile ices such as ammonia being present. Ganymede’s surface has an albedo of about 43%, which suggests that water ice makes up a mass fraction of 50-90% the surface. Near-infrared and ultra-violet surveys have also revealed the presence of carbon dioxide, sulfur dioxide, and possibly cyanogen, hydrogen sulfate and various organic compounds. More recent data has shown evidence of salts such as magnesium sulfate and possibly sodium sulfate, which may have originated from the subterranean ocean (see below). Ganymede’s interior appears to be fully differentiated, consisting of a solid inner core made of iron, a liquid iron and iron-sulfide outer core, a silicate mantle, and a a spherical shell of mostly ice surrounding the rock shell and the core. The core is believed to measure 500 km in radius, and has a temperature of about 1500 – 1700 K and pressure of up to 10 GPa. The most compelling evidence for the existence of a liquid, iron-nickel-rich core is Ganymede’s intrinsic magnetic field. The convection in the liquid iron, which has high electrical conductivity, is the most reasonable model of magnetic field generation.The density of the core is believed to be 5.5 – 6 g/cm³, while the silicate mantle has an estimated density of 3.4 – 3.6 g/cm³. This mantle is composed of silicate materials, most likely chondrites and iron. The outer ice shell is the largest layer of all, measuring an estimated 800 km (497 miles) thick. The precise thicknesses of this and other layers in the interior of Ganymede depends on the assumed composition of silicates and amount of sulfur in the core. Scientists also believe that Ganymede has a thick ocean nestled between two layers of ice – a tetragonal layer between it and the core and a hexagonal layer above it. The presence of this ocean has been confirmed by readings taken by orbiters and through studies of how Ganymede’s aurora behaves. In short, the moon’s auroras are affected by Ganymede’s magnetic field, which in turn is affected by the presence of a large, subsurface salt-water ocean. Ganymede’s surface is a mix of two types of terrain. There’s the very old, highly cratered, and dark regions, and the somewhat younger, lighter regions marked with an extensive array of grooves and ridges. In a way that is similar to Europa, Ganymede’s surface is asymmetric, with the leading hemisphere being brighter than the trailing one. The dark terrain, which comprises about one-third of the surface, is so-colored because the surface ice in these regions contains clays and organic materials. It has been theorized that these have been left behind by impactors, which accords with the fact that impact craters are far more extensive in the areas of dark terrain. Meanwhile, the grooved terrain is believed to be tectonic in nature; which could be due in part to cryovolcanism, but is thought to be mostly the result of tidal heating events. The tidal flexing could have heated the interior and strained the lithosphere, leading to the development of cracks, graben and faults that erased the old, dark terrain on 70% of the surface. Though craters are more common in the darker areas, they are seen all over the surface. Ganymede may have experienced a period of heavy cratering 3.5 to 4 billion years ago similar to that of the Moon. If true, the vast majority of impacts happened in that epoch, whereas the cratering rate has been much smaller since. Craters on Ganymede are also flatter than those on the Moon and Mercury, which is probably due to the relatively weak nature of Ganymede’s icy crust. Ganymede also has polar caps, likely composed of water frost, which were first seen by the Voyager spacecraft. Since the discovery, several theories have been proposed for their formation, ranging from the thermal migration of water vapor to higher latitudes to plasma bombardment turning the ice brighter. 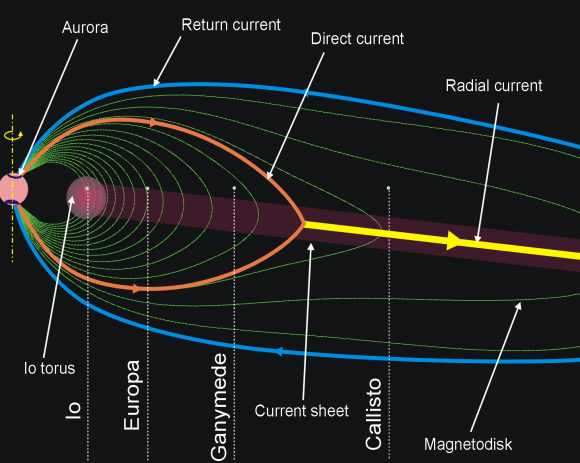 Data obtained by the Galileo spacecraft – which noted a very close correspondence between the polar cap boundary and the boundaries of the moon’s magnetic field – suggests that the latter theory is correct. Similar to Europa, Ganymede has a tenuous oxygen atmosphere. Also similar to Europa is how the atmosphere formed, which involves water ice on the surface being split into hydrogen and oxygen through interaction with UV radiation, the hydrogen being lost to space and the oxygen being retained. The surface pressure of this atmosphere is thought to lie within the range of 0.2–1.2 micro Pascals. The presence of this atmosphere also causes an airglow effect, a faint emission of light caused by the interaction of atomic oxygen and energetic particles. This effect is not uniformly distributed (as with Europa), but instead causes bright spots to appear above the polar regions – which could be “polar auroras” – due to the planet’s magnetic field. Additional evidence of the oxygen atmosphere comes from the detection of various gases trapped in the ice on Ganymede. This evidence consisted of the spectroscopic detection of ozone (O³), as well as absorption features that indicated the presence of oxygen gas (O²). Another constituent of the atmosphere is hydrogen, which (despite most being lost to space) still exists at a surface in very minor concentrations. The existence of this neutral atmosphere implies that an ionosphere should exist since oxygen molecules are ionized by the impacts of the energetic electrons coming from the magnetosphere and by solar electromagnetic UV radiation. However, the existence of an ionosphere remains controversial, due to conflicting data gathered by different missions. Ganymede is unique among moons in the Solar Systems in that it alone has a magnetosphere. The value of the moon’s permanent magnetic moment is estimated to be 1.3 x 10¹³ T·m³, which is three times larger than the magnetic moment of Mercury. The magnetic dipole is tilted with respect to the rotational axis of Ganymede by 176°, which means that it is directed against the Jovian magnetic moment. The dipole magnetic field created by this permanent moment has a strength of 719 ± 2 Teslas (nT) at Ganymede’s equator, and roughly twice that at the poles (1440 nT). This magnetic moment also carves a part of space around Ganymede, creating a tiny magnetosphere embedded inside that of Jupiter with a diameter of about 10,525 – 13,156 km. The Ganymedian magnetosphere has a region of closed field lines located below 30° latitude, where charged particles (electrons and ions) are trapped, creating a kind of radiation belt. The main ion species in the magnetosphere is single ionized oxygen, which fits well with Ganymede’s tenuous oxygen atmosphere. The interaction between the Ganymedian magnetosphere and Jovian plasma is in many respects similar to that of the solar wind and Earth’s magnetosphere. The plasma co-rotating with Jupiter impinges on the trailing side of the Ganymedian magnetosphere much like the solar wind impinges on the Earth’s magnetosphere. In addition to the intrinsic magnetic moment, Ganymede has an induced dipole magnetic field who’s existence is connected with the variation of the Jovian magnetic field near Ganymede. The induced magnetic field of Ganymede is similar to those of Callisto and Europa, indicating that this moon also has a subsurface water ocean with a high electrical conductivity. However, the existence of Ganymede’s magnetosphere remains a bit of a mystery. On the one hand, its existence is believed to be the result of Ganymede’s a dynamo effect caused by conducting material moving in the core, similar to Earth. However, other bodies that have differentiated metallic cores don’t have magnetospheres, and the relatively small size of Ganymede’s core suggests that it should have cooled sufficiently that fluid motions are no longer possible. One explanation for this incongruity is that the same orbital resonances that may have disrupted the surface also allow the magnetic field to persist. With tidal heating increasing during such resonances, the mantle may have insulated the core, preventing it from cooling. Another explanation is a remnant magnetization of silicate rocks in the mantle, which is possible if the satellite had a more significant dynamo-generated field in the past. There is some speculation on the potential habitability of Ganymede’s ocean. An analysis published in 2014, taking into account the realistic thermodynamics for water and effects of salt, suggests that Ganymede might have a stack of several ocean layers separated by different phases of ice, with the lowest liquid layer adjacent to the rocky mantle below. This is important, since the layer closest to the rocky interior would be subject to heating due to tidal flexing in the mantle. This heat could be transferred into the water via hydrothermal vents, which could provide the necessary heat and energy to sustain life. Combined with oxygenated water, life forms could exist at the core-mantle boundary in the form of extremophiles, in a way that is similar to what is found in Earth’s oceans (and presumed to exist in Europa’s interior ocean). Several probes flying by or orbiting Jupiter have explored Ganymede more closely, including four flybys in the 1970s, and multiple passes in the 1990s to 2000s. The first approaches were conducted by the Pioneer 10 and 11 probes, which approached the moon in 1973 and 1974, respectively. These missions returned more specific information on its physical characteristics and resolved features to 400 km (250 mi) on its surface. The next missions came in 1979, when the Voyager 1 and 2 probes passed the moon, refining estimates of its size and revealing its grooved terrain for the first time. In 1995, the Galileo spacecraft orbited Jupiter and went on to make six close flybys between 1996 and 2000. The probe’s findings included the discovery of Ganymede’s magnetic field, the moon’s interior ocean, and a large number of spectral images that showed non-ice compounds on the surface. The most recent mission to Ganymede was made by the New Horizons probe in 2007. While en route to Pluto, the probe obtained topographic and composition mapping data of Europa and Ganymede during its flyby of Jupiter. Their are no missions to Ganymede currently in operation, but several missions have been proposed for the coming decades. One such proposal is the joint NASA/ESA Europa Jupiter System Mission (EJSM), which would explore Jupiter’s moons (including Ganymede) and has a proposed launch date of 2020. The mission would consist of NASA’s Jupiter Europa Orbiter, the ESA’s Jupiter Ganymede Orbiter, and possibly a JAXA Jupiter Magnetospheric Orbiter. The ESA’s contribution was renamed the Jupiter Icy Moon Explorer (JUICE) in 2012, and obtained a launch slot aboard the ESA’s Cosmic Vision science program (scheduled for launch in 2022 or 2024). 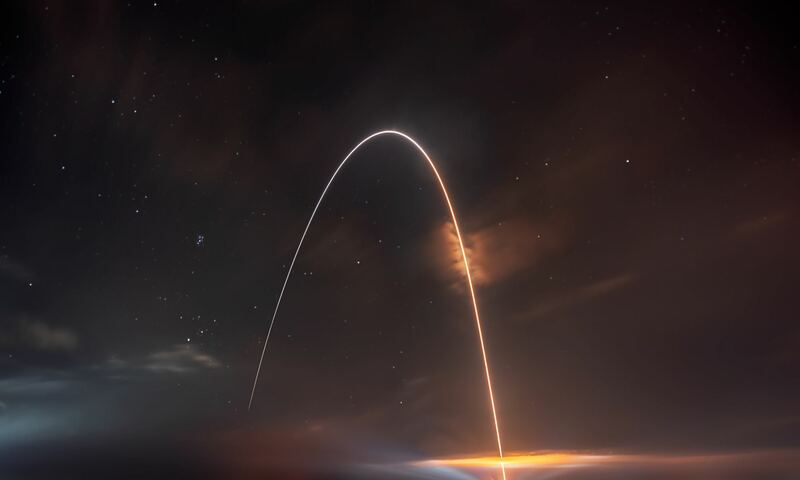 This may include a partner mission from the Russian Space Research Institute – known as the Ganymede Lander (GL) – and would involve JUICE examining Ganymede from orbit and conducting multiple flybys or Europa and Callisto. A Ganymede orbiter based on the Juno probe was also proposed in 2010 for the Planetary Science Decadal Survey. As part of the committee report presented at the Survey – titled “Vision and Voyagers for Planetary Science in the Decade 2013-2022” – a concept study for a possible Ganymede Orbiter was proposed, which included recommendations on instrumentation. A canceled proposal for a Ganymede orbiter was the Jupiter Icy Moons Orbiter (JIMO), which would have performed a flyby of Europa, Ganymede and Callisto. Designed to use nuclear fission for power and an ion engine for propulsion, JIMO would have studied Ganymede in greater detail than an previous orbiter. However, the mission was canceled in 2005 because of budget cuts. Ganymede is considered a possible candidate for human settlement – and even terraforming – due to the many advantages it presents. For one, as Jupiter’s largest moon, Ganymede has a gravitational force of 1.428 m/s2 (the equivalent of 0.146 g) which is comparable to Earth’s Moon. Sufficient enough to limit the effects of muscle and bone degeneration, this lower gravity also means that the moon has a lower escape velocity – which means it would take considerably less fuel for rockets to take off from the surface. What’s more, the presence of a magnetosphere means that colonists would be better shielded from cosmic radiation than on other bodies. The prevalence of water ice means that colonists could also produce breathable oxygen, their own drinking water, and would be able to synthesize rocket fuel. Unfortunately, beyond this, Ganymede presents numerous challenges for colonization. For starters, the presence of a magnetosphere does not shield Ganymede from enough cosmic radiation to ensure human safety, due to the fact that it is overshadowed by Jupiter’s powerful magnetic field. This results in the surface receiving some 8 rem of radiation per day – which is 333 times the average of what Earth-bound organisms experience in a year. The dominance of Jupiter’s magnetic field also means that Ganymede’s magnetosphere is not strong enough to retain an atmosphere of sufficient density to sustain human beings. It would also be insufficient to retain much heat. Hence, settlements on the surface would need to be heavily insulated, shielded from radiation, and contain a breathable atmosphere. A possible solution to this, similar to what has been proposed for Europa, would be for colonists to build settlements within the icy mantle, or possibly under the surface of the ice entirely. These embedded (or aquatic habitats) would be shielded from harmful cosmic radiation by the icy mantle. They could also function as conduits between the ocean and the surface, piping water in and processing it into fuel for export. However, such possibilities are still far from realization and in the meantime, exploring Ganymede and deciphering its deeper mysteries remains the priority. And of these, Ganymede has several! Much like the other Galilean moons, Ganymede possesses a wealth of unique and mysterious attributes, many of which still defy comprehension. In addition to being the largest moon in the Solar System, it is the only moon other than Earth (and the gas giants) to have a magnetic field. And of course, there’s the possibility that life could exist beneath its icy crust, possibly in microbial or extreme form. All of these make Ganymede an intriguing prospect for future exploration. 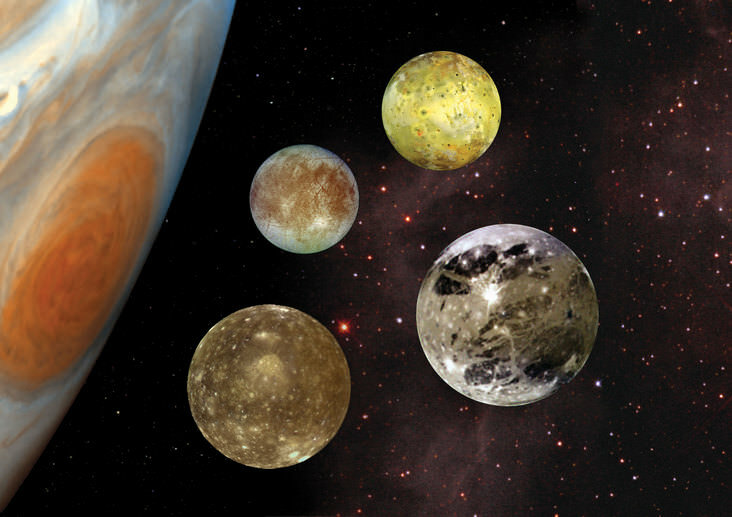 We have many interesting articles on Ganymede and Jupiter’s Moons here at Universe Today. Here is a list of the Galilean Moons, as well as Jupiter’s entire system of moons. Here is one about Ganymede’s interior ocean, and how an amateur astronomer made a detailed map of Ganymede. Here’s a list of all the largest moons in the Solar System, and a listing of the largest moons and smallest planets at Solar Views. Universe Today has whole series of podcasts about the Solar System at Astronomy Cast. As always, thanks for these articles. Previous PostPrevious Why Do Red Giants Expand? Next PostNext Why Don’t We See the Curiosity Rover’s Arm When it Takes a Selfie?